This year has been a good year for wintering owls here in Indiana. 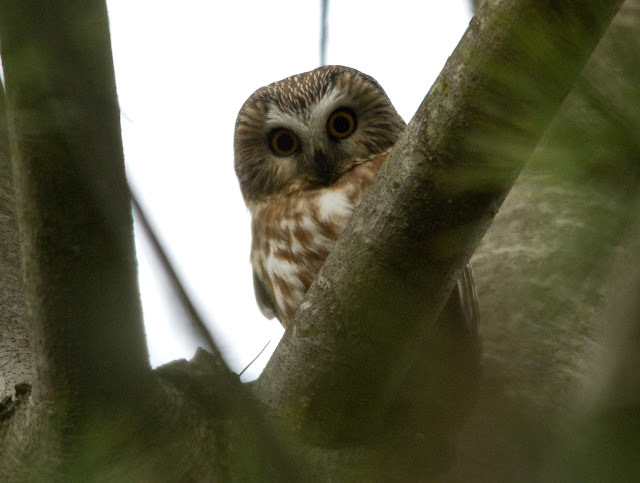 There have been quite a few Saw-whet Owls reported and even some reports of Long-eared Owls. A couple of weeks ago my friend Landon found both a Northern Saw-whet Owl and three Long-eared Owls in the same pinery on his home turf in rural Cass County. My brother and I were able to sneak away for a day of birding. After picking Landon up in Logansport, we headed straight for France Park where the owls had been seen. It didn't take long before I found one of the Long-eareds! 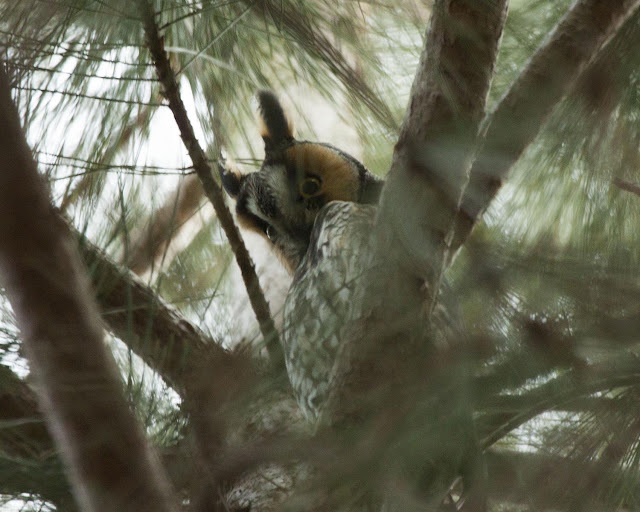 A Long-eared Owl peering down at us! Another shot of the Long-eared. Shortly after leaving this owl, Eric spotted the Northern Saw-whet Owl. We did not know that these two owls would stay in such close proximity to each other. With the Long-eared's significant size advantage, we thought that the Saw-whet might actually become a prey item! Eric's photo of the Saw-whet Owl. Since we had both owls, we moved on as to not disturb them any more than we already had. We managed not to flush a single owl off of its roost during our visit to the pinery. Remember that when you have the chance to visit wintering owls, you should always take every precaution not to cause them to flush off their roosting spots. Repeated flushing tends to lead the owls to abandon their wintering ground in search of a calmer location. This is hard on the owls and very frustrating to other birders who would have liked to see the birds! We ended the day with a Barred Owl in another location giving us a pretty awesome 3 owl day! love, love, love your photos and your blog! Fantastic! Sounds like you had a very successful owl excursion. Awesome photographs! So jealous. Very hard to find owls in south Fl. Love these photos! I'm hooked! First, great images of these often all-too difficult to photograph creatures. Second (and perhaps more important), I genuinely held your birding ethics in high esteem as you took care to not flush these owls. I just get the warm fuzzies when I see/read/heard someone approaching their birding with an altruistic mindset. Thanks Radd! We are always very careful not to disturb the birds we are watching/photographing. 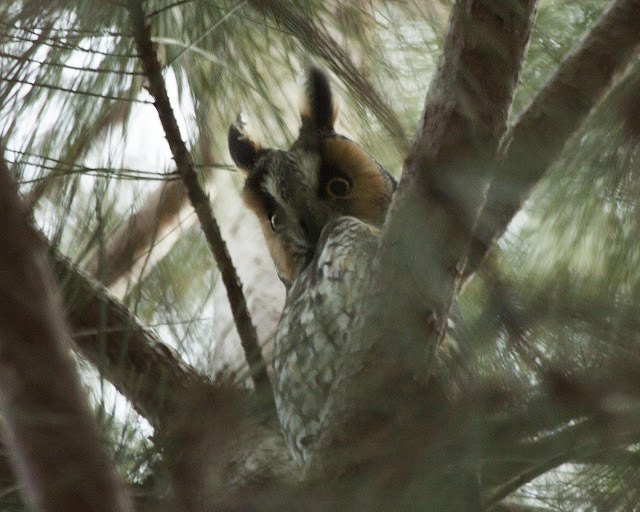 Unfortunately we had an incident a couple days later where some birders spent way to long in the pinery and the Long-eared Owls have not been seen since. It's very disappointing when birders act irresponsibly. Great outing, Rob! I love the cute Saw-whet Owl. Wonderful photos! Thanks! It is always so much fun to have a chance to photograph these species! Love the image of the Saw-whet! They are so beautiful! Oh man, that Saw-whet Owl gets the "Ahh. Cute!" eAward of the day!